Find Better Ideas, Faster ® with a custom entrepreneur trend report, our PRO Dashboard and 80+ categories of premium trend reports. 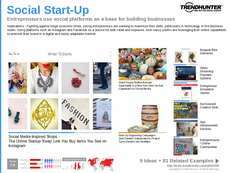 This Entrepreneur Trend Report compiles the latest business ideas and platforms that cater to start-up businesses, including finical advising outlets and business meet-ups for entrepreneurs. 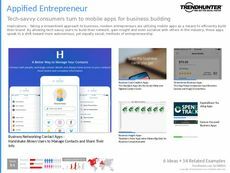 The Entrepreneur Trend Report is focused on highlighting the most innovative new brands, as well as noting the top professional networking platforms and tech apps that bring entrepreneurs together, or in front of the right people. This report will also show you new avenues and insights into successful business ventures. Start-up businesses, businesspeople and aspiring entrepreneurs will all be able to use the crowdsourced Entrepreneur Trend Report to investigate the latest emerging brands, companies and start-up ventures that have the potential to disrupt some of the most well-known industries out there today. 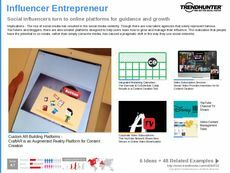 The Entrepreneur Trend Report will bring you direct insights into new brands and companies as well as outlets, online platforms, guides and trends that are noticed among those with entrepreneurial mindsets.